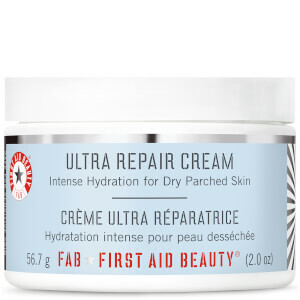 FAB Ultra Repair Cream is a thick, rich, emollient product that hydrates deep down with exceptional penetration. 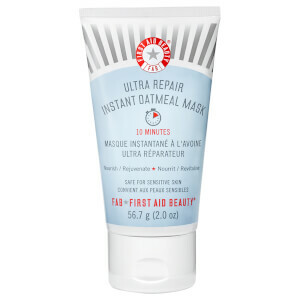 With the help of Colloidal Oatmeal, Shea Butter, soothing Eucalyptus Oil and ceramides, FAB Ultra Repair Cream provides immediate relief and visible improvement for distressed skin. FAB Antioxidant Booster is there to defend skin from free radical damage. Ultra Repair Cream can be used all over the body and on the face. Relieves minor irritation and itching. Reduces symptoms of eczema, dermatitis, and keratosis pilaris. Formula is free of parabens, harsh chemicals and colorants. Colloidal Oatmeal, Water, Stearic Acid, Glycerin, C12-15 Alkyl Benzoate, Caprylic/Capric Triglyceride, Glyceryl Stearate, Glyceryl Stearate SE, Cetearyl Alcohol, Caprylyl Glycol, Phenoxyethanol, Butyrospermum Parkii (Shea Butter), Squalane, Allantoin, Sodium Hydroxide, Dimethicone, Xanthum Gum, Disodium EDTA, Chrysanthemum Parthenium (Feverfew) Extract, Camellia Sinensis Leaf Extract, Butylene Glycol, Glycyrrhiza Glabra (Licorice) Root Extract, Eucalyptus Globulus, Ceramide 3. I had some kind of rash on my arms that two trips to the dermatologist didn't solve. This cream did the trick. It is creamy without being sticky at all. It also leaves my skin feeling moist and happy. I won't do without it and now use it as a daily moisturizer. After three appointments with dermatologists to deal with a rash on my arm with no improvement, I tried this cream. It did the trick and my skin is much improved. I will keep using it. It feels great, not too heavy or sticky and it absorbs into my skin. Thanks! I love this lotion. It actually helps me with my kp and minimize the appearance of razor bumps. The texture is great, and I love the way it blends into the skin so easily. 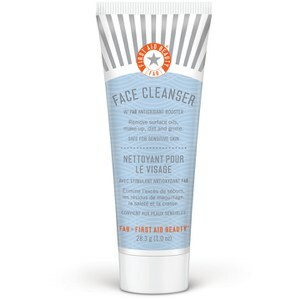 it totally worths the price and works well for sensitive and irritated skin. The Best Moisturizer I Have EVER Used! My feet were so rough and dry. 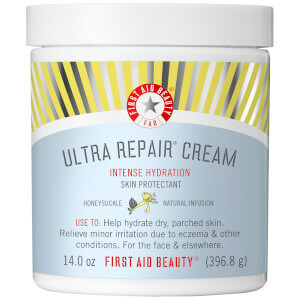 I use First Aid Beauty Repair cream. It's like a miracle. My feet feel so good. I use it as a body cream as well and it's the best facial moisturizer I have ever used. All natural too. This is an amazing cream. I will not put anything on my face or body with chemicals again. It has to be harmful. To think I have spent hundreds of dollars I have spent on chemicals is scary!My husband is bald and had pre-cancerous brown spots on his head. After using it for 2 weeks they are gone! Can't say enough about this cream. This cream is very soothing for rough, dry skin. I use it all over my body.Wish Skinstore could carry the 12 oz size. I have purchased this a couple of times before, mainly to use on my hands. About a month ago I had a bad reaction to a medication. My face broke out, became very red and swollen, with extreme dry patches. I was also very itchy. My regular cream wasn't helping. I remembered I had this, thank goodness, and decided to give it a try. I started feeling better right away. Now I am almost back to normal. I mix this with my Mario badescu, and philosophy's Help Me retinol cream. It is not greasy at all, and absorbs very quickly. Don't hesitate.Hope you love it too.